Have you ever had the experience of blurting out a secret shame and then discovering that other people shared your secret? None of them were willing to talk about it either, and you all thought you were alone. But it’s not true. It turns out you have friends after all. Well, you can! Just because everyone has been telling you for years that The Empire Strikes Back was the best of the original trilogy doesn’t mean you have to keep quiet and knuckle under to the mob. That’s what Goebbels counted on, right? So say it proudly: Return of the Jedi is the best of the six Star Wars movies! Come out of the closet! And now, in the spirit of all those counterintuitive essays that Slate is so famous for, here’s why. But first, a bit of throat clearing. In any trilogy, the first and last episodes have a built-in advantage. The first episode gets to introduce the setting and it gets to introduce all the characters and all the themes. Learning about the Force for the first time is just unbeatable. And the last episode gets to wrap everything up. If you do a good job of it, that’s unbeatable too. The middle piece, though, can be a real slog. We already know all the characters and we’re not going to get a resolution. Just lots of exposition. So the middle part is really hard. To borrow a phrase, it has a very high degree of difficulty. And if you count that, maybe Empire was a better movie than the others. We got a great new character in Yoda and a great new theme in the Luke/Vader relationship. Given the hurdles it had to overcome, it was a helluva good film. But resolving an epic tale satisfyingly is pretty hard too, and on an absolute scale I still think Jedi is underrated. So now, with my throat clearing out of the way, let’s dive right in and address the elephant in the film: Ewoks. You hate them. I hate them. Everyone hates them. But don’t let that blind you. The truth is that there’s less of them than you think. There are, basically, two extended Ewok sequences. The first, when the Ewoks capture Luke and Han, is inexcusable. I won’t even try. But it’s only ten minutes of a two-hour movie. The second sequence is the battle for the shield generator station, and in that one the Ewoks really don’t matter. It’s a set-piece fight, and the Ewoks are just the extras — small, furry extras, but still extras. Ignore them. If someone recut the film to excise most of the first, infuriating Ewok sequence, I honestly think a lot of people would see the rest of it in a whole different light. So the Ewoks aren’t enough to ruin the film. But what makes it great? For starters, there’s the start. 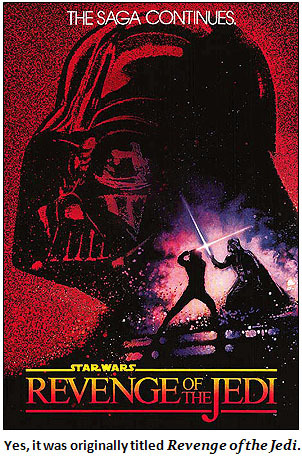 The introductory sequence where Darth Vader pays a visit to the new Death Star is riveting, and its closing line — “The emperor is not as forgiving as I am” — pitch-perfect and perfectly delivered by James Earl Jones — is one of the best of the entire trilogy. What a way to pull you in! who isn’t fully engaged in this film after its first half hour has no business being in the theater in the first place. And there’s more. Visually, Jedi is far and away the best of the Star Wars movies. Face it: Hoth and Dagobah and the Cloud City were kind of meh, visually. And in movies like this, that matters. But Jedi has stunning visuals everywhere. It might not be easy to remember at this late date, for example, but the speeder chase on the forest moon was pretty spectacular in 1983. Hell, it’s not bad now. The Death Star is gorgeous, and the emperor’s throne room is a masterpiece of lighting and set design. The night sequences in the tree city are beautiful. The whole movie is a visual feast. The arc of the story is completely engaging too. There’s the Luke story, the Han/Leia story, and, of course, the Darth Vader story. There are a hundred ways any of these could have been fucked up (cf. the entire prequel trilogy), but they weren’t. 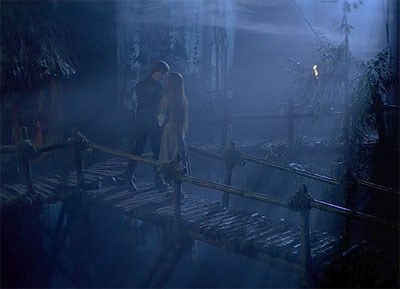 Take the treetop scene between Luke, Leia, and Han. This had to happen. We all knew it was going to happen. Any false notes would have wrecked it, but there weren’t any false notes. Mark Hamill, granted, is not filmdom’s finest actor, but even so the whole sequence plays out fluidly and convincingly. When Luke tells Leia she’s his sister, what should she say? The answer is: “I know. Somehow I’ve always known.” And that’s exactly right. Once she’s said it, you know it’s the only thing she could have said. 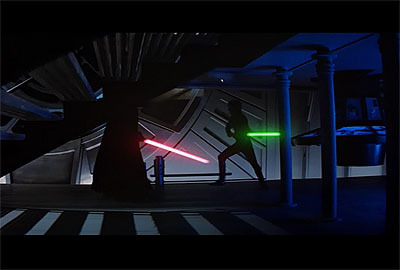 long final sequence in the throne room is capped off by a shorter final scene on the hangar deck between Luke and Vader. This was a genuinely poignant scene. Even the music was perfect. All you have to do is watch Revenge of the Sith to understand just how ineptly a heroic space opera based on elemental clashes can be wrapped up. It’s no mean feat to resolve a story like this in both a narratively convincing and emotionally compelling way, but Return of the Jedi does it, and does it without stinting on the action and without letting the wheels and pulleys show. This is much, much harder than it looks. So put aside your hate! (Of Ewoks.) Instead, do this. Relax. Empty your mind of all Ewok thoughts. Then watch the movie again. At about 1:07, click ahead three chapters. That’s it. Aside from that one ten-minute sequence, the Ewoks are just furry extras, not nearly as annoying as you remember them. And while the first two parts of the original trilogy are great on their own merits, the remaining 117 minutes of Jedi — its visuals, its pacing, its character development, its resolution of all the trilogy’s main themes — make it the best and most satisfying of the bunch.